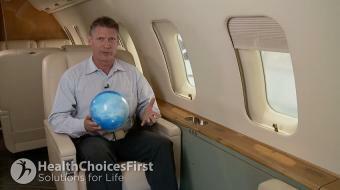 Jackson Sayers, BSc (Kinesiology), discusses postural products for flying. 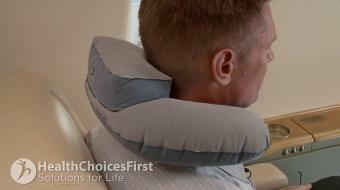 Airplane and Travel Products For Maximum Comfort Jackson Sayers, BSc (Kinesiology), discusses postural products for flying. When you're flying on the plane there's several great health products that can help you with your comfort and your posture when you're flying. 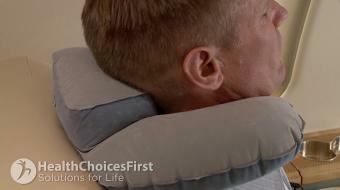 The neck brace, this is a Samsonite product. I bought it at the airport, I've had it for about three or four years and it's great. Whenever I want to have a nap on the plane and I want to lean back it really supports my neck from going both sidways and backwards and forwards. I find it a very nice piece of equipment that I can use when I fly. It really helps me sleep a lot better. Another health product that I like is the compression stocking. It can really help alleviate lower body pain and lower body cramping on a long flight. I find that if you put it on before the flight starts, they look nothing like a new pair of dress socks, but they really help eliminate the circulation problems we have in the lower body. When you're sitting on a plane for a long time your heart is not pumping the blood down to the legs. Diabetics have a very difficult time on long flights, just getting circulation going. So don't be embarrassed, don't be afraid, put on the compression stocking before you get on the flight and it'll really help alleviate that discomfort in the lower body. 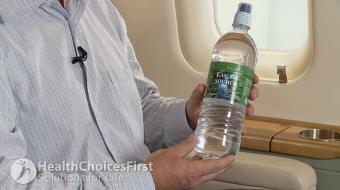 Another health product that might seem a bit obvious but it's one of the number one things we should be thinking about when we fly is water. Ninety-five percent of us are probably dehydrated most of the day, and when we get on a plane and we're in an environment that is decompressed, water is our best friend. Circulation in the body is the number one problem with flying and water is the number one way to combat it. So don't be afraid to drink lots of water. It will also help you get up more, it will help you alleviate any kind of low back pain. But the tip is drink lots of water - it's only going to help you when you get off the plane. Another health product that I like to use that's a bit more unconventional but I think it's probably the most effective tool you can use on the plane is just a small little kids rubber ball. You know you can get them at almost any little store and it's a simple tool. You just simply put it between your knees. You don't really even need to squeeze the ball a lot, because you couldn't hold that for the whole flight anyway. If you just sort of squeeze the ball 5 or 10 percent, it fires up the psoas muscle in the groin. It fires up the low back and the hips and more importantly it gets everything square. If your knees are square at the end of the day you know your hips are square. And the problem without the ball is that you start to get into this kind of position or you start to cross your legs and then your hips start to turn. And then all those old nagging back injuries start to become much more apparent on the plane. So what I like to suggest is just sit up nice and straight, hold the ball between your knees, and that's really going to help you when you get off the plane.